Background: Although the burden of cardiopulmonary diseases in the Aboriginal community is high, utilisation of rehabilitation services has been poor. 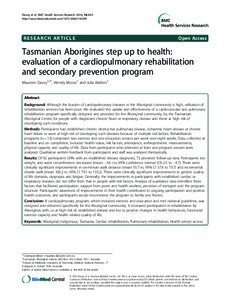 We evaluated the uptake and effectiveness of a cardiovascular and pulmonary rehabilitation program specifically designed and provided for the Aboriginal community, by the Tasmanian Aboriginal Centre, for people with diagnosed chronic heart or respiratory disease and those at high risk of developing such conditions. Methods: Participants had established chronic obstructive pulmonary disease, ischaemic heart disease or chronic heart failure or were at high risk of developing such diseases because of multiple risk factors. Rehabilitation programs (n = 13) comprised two exercise and one education session per week over eight weeks. Data, collected at baseline and on completion, included health status, risk factors, attendance, anthropometric measurements, physical capacity and quality of life. Data from participants who attended at least one program session were analysed. Qualitative written feedback from participants and staff was analysed thematically. Results: Of 92 participants (39% with an established disease diagnosis), 72 provided follow-up data. Participants lost weight, and waist circumference decreased (mean -3.6 cm, 95% confidence interval (CI) -2.5 to -4.7). There were clinically significant improvements in six-minute walk distance (mean 55.7 m, 95% CI 37.8 to 73.7) and incremental shuttle walk (mean 106.2 m, 95% CI 79.1 to 133.2). There were clinically significant improvements in generic quality of life domains, dyspnoea and fatigue. Generally, the improvements in participants with established cardiac or respiratory diseases did not differ from that in people with risk factors. Analysis of qualitative data identified three factors that facilitated participation: support from peers and health workers, provision of transport and the program structure. Participants' awareness of improvements in their health contributed to ongoing participation and positive health outcomes, and participants would recommend the program to family and friends.